I had to go to the huge horrible mall to get this gorgeous thread. 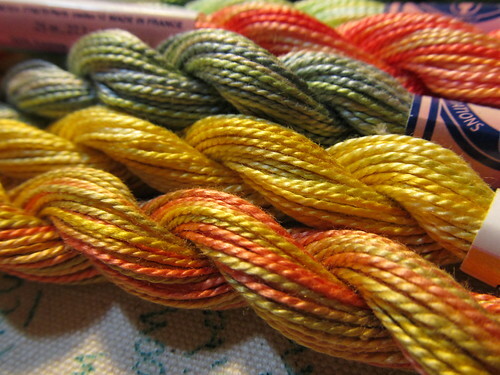 It is perl cotton in variegated colors, and aside from the fact that I was looking for deep yellows and they were out it was a pretty successful trip. From some exhaustive looking, I know this is the only place that carries it. I've tried online but freaked out because no one describes it the same way anywhere, and here I can poke it. Alice came, and we found her some string with wire in it so she can make some of the fancy knots she learned at the Origami Convention, and I found these lovely colors, and we stopped and played with the plastic animals until we realized we'd told Aerin we'd be back half an hour ago. 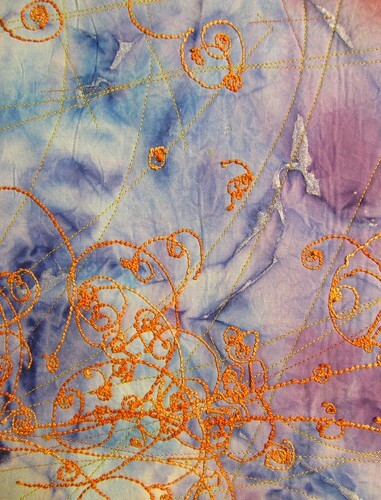 Anyhow – I needed the yellow orange to complete this piece. If you can tell me what it is in the comments, I'll send you a chicken postcard. Evidence for the Higgs boson? Yummy looking thread! …filigree decorating an 18th-century hot-air balloon? it’s a close up of a jellyfish feeding! How fun! Looks like dodder hunting for a green plant to hook up with. Yummy thread, by the way.